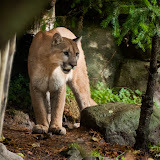 I had a couple of hours to kill in Portland this past Saturday afternoon so I made my first visit to the Oregon Zoo. Between the intermittent rain showers I photographed some of the more interesting animals (and people). I've been to quite a few zoos, and this one ranks high on my list. I found the Great Northwest area of the zoo to be particularly impressive with its diverse animals, habitats, and forested layout. Maybe it was because of the lower temperatures or the on-again off-again rain, but many of the animals seemed particularly alert and active. ...and pouncing when the other least expected it. This polar bear was snoozing until rain started falling more heavily. I snapped this as the rain woke it up. It soon moved out of the rain. The damara zebra. Not just black and white. Categories: "Bobcat", "Giraffe", "Mountain Goat", "Mountain Lion", "Oregon Zoo", "Oregon", "Otter", "Polar Bear", "Portland", "Tourism", "Zebra", "Zoo", "wildlife"